The West Hollywood coffee shop is the first of many concepts the famed baker is opening in Los Angeles. Ready for a pick-me-up? 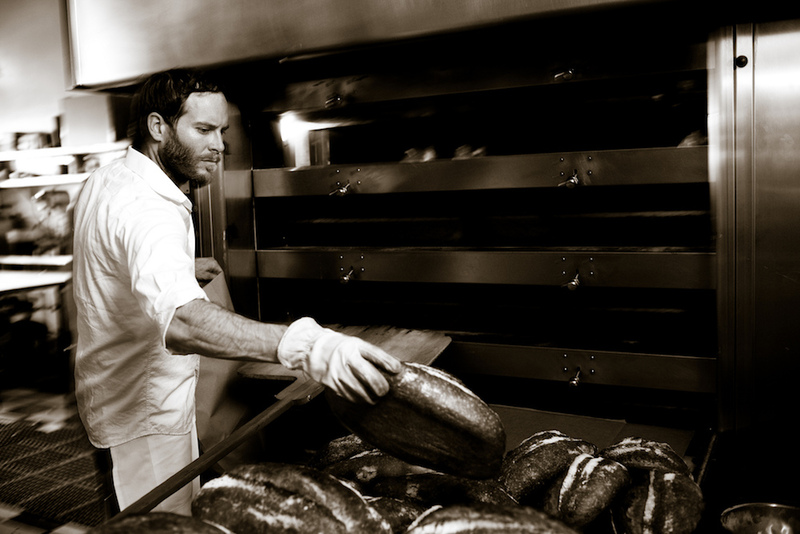 Chef/baker Chad Robertson's Tartine is opening its first L.A. outpost on Monday. The Fred Segal Café by Tartine, part of Fred Segal's new flagship retail destination in West Hollywood, will launch with coffee from Tartine's own Coffee Manufactory. A food menu with baked goods and fresh sandwiches, including new items Robertson and his team have been developing for the last year in San Francisco, will debut by early next year. Tartine, which opened one of Food & Wine's 2017 Restaurants of the Year, is in the process of building out a kitchen adjacent to the café. And Robertson, of course, is also in the middle of putting together the massive, nearly 40,000-square-foot Tartine Manufactory at downtown L.A.'s Row DTLA complex. That Tartine Manufactory, which will include Robertson and Elisabeth Prueitt's craft mill and bakery, two restaurants with food from famed Phoenix pizzaiolo Chris Bianco, a market, an ice cream/donuts/coffee shop and a Coffee Manufactory laboratory and roastery that's a partnership with Califia Farms, will start opening in phases next spring. In the meantime, Tartine's coffee is being served at buzzworthy L.A. restaurants including Felix, Botanica and Destroyer. Two forthcoming blockbuster Hollywood restaurants, April Bloomfield's Hearth & Hound and Adam Perry Lang's APL, will also use Coffee Manufactory products. Robertson likes to describe his ventures as collaborations between like-minded industry veterans, and he credits Coffee Manufactory chief operating officer Chris Jordan for making Tartine's coffee ambitions possible. "I've been buying coffee out of Colombia for 18 years," Jordan says. Jordan's experience in sourcing, roasting and all other facets of coffee procurement and development make him a good match for Robertson, who opened his first Tartine in 2002. Jordan previously worked for Starbucks, the TechnoServe Coffee Initiative (funded by the Bill and Melinda Gates Foundation) and Dormans Coffee in Nairobi before becoming the CEO of Verve Coffee Roasters. His longtime relationships and knowledge means that Coffee Manufactory's sustainable supply chain includes Ethiopia, Kenya, Colombia, Honduras, El Salvador and Guatemala. It helps that Coffee Manufactory is also sourcing coffee for the Califia cold brew you can find everywhere from Target to specialty grocery stories. This gives the socially conscious Tartine tremendous buying power. "That collaboration especially is really allowing us to buy the coffees we want in the way we want and make an impact," Robertson says. Robertson, who had previously been in the middle of a merger with Blue Bottle that fell through, has seen the rise of third-wave coffee in many ways. He remembers observing people in line at Tartine in San Francisco seven or eight years ago. Customers were waiting patiently for food while sipping coffee they had purchased elsewhere. "They would say, 'You guys have the best food, but you don't have the best coffee,'" Robertson recalls. So Robertson saw a problem that he wanted to fix, and it led him down a new path for his growing empire. "Fred Segal is the pilot of this small, serious coffee shop that will have a serious food component in a small footprint with a minimal kitchen," Robertson says. "I love the idea of doing this with Fred Segal. They're huge supporters of collaboration." Fred Segal is a collection of upscale shops and brands within one storefront. And Tartine wants to bridge the gap between the rarefied and the accessible. "It's like eating a three Michelin-starred meal at a picnic table," Robertson says. "I still want something at the highest level, but I want it to be approachable and affordable." As he's said before, Robertson's goal for what's become known as third-wave coffee is "bringing it to everyone quickly and efficiently and more affordably." Between Califia's mass-market penetration and the recent acquisition of Blue Bottle by Nestle and the Peet's/Intelligentsia/Stumptown/Panera Bread family that a German conglomerate has assembled, high-end coffee for everyone will likely become more of a reality. "We're definitely in a coffee gold rush," Robertson says. His goal now, as it was when he was involved with Blue Bottle, is to bring "really serious food" into coffee shops. It's something, he notes, that is common in Australia but still in its formative stages in America. "We're trying to be authentic to ourselves and the mission of sourcing the best coffee and the best food in an all-day casual way," says Robertson, who's building a network of farmers and suppliers in California and Oregon for his L.A. ventures. And when Tartine Manufactory's coffee lab opens downtown, you can expect visits from international coffee players. "We might actually have roasters from Japan," Jordan says. "We might have producers from Colombia coming in." Their collaborative experimentation could lead to new products being created in what Jordan stresses is a "high-capacity production facility." That's the Tartine way in 2017. You do a lot of small things and you also think really big.